After much thought and discussion, we hope that the timetables will provide plenty of traditional branch line variety, with a particularly good cross section trains running from several different eras. The GWR Local set will be formed of 7377 + 1295, and the BR Local will be just W1645 (which will look particularly nice when running with 1450 which will retain its present weathered black livery for the event). The Devon Diesel Society are now sourcing a variety of winter style ales which will be available from the bar at Staverton on each Saturday and Sunday. There is late opening of the bar (with connecting trains) on both Saturday and Sunday of the first weekend (including a quiz on the Sunday), and again on the second Saturday. See the stunning Devon scenery and spectacular River Dart from the warmth of the train. Refreshments, Gift Shop and Museum at Buckfastleigh. 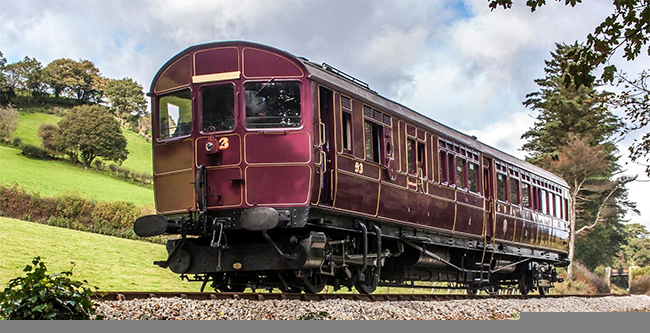 Steam Railmotor tickets now available – book NOW to avoid disappointment – there is a maximum of 52 tickets per round trip of the Steam Rail Motor. Tickets to the Steam Railmotor cost £20.00 per adult (16 years old and over); £15.00 for Children (3-15) and NO discounts or consessions apply. For those not wishing to travel in the Steam Rail Motor then it will be in Buckfastleigh platform for visitors to look around. Platform Tickets will have to be purchased from the Booking Office. Adults £1.00, Children £0.50. Visitors with travel tickets valid on the day can view without extra charge. Note: ordinary travel tickets can be upgraded if there is space on the Steam Rail Motor, NOTE: Due to popular demand the SRM is available for use additionally on FRIDAY 22nd February – see Friday’s timetable below. If you haven't been issued with a 2013 South Devon Railway Line Side Pass, you are welcome to take photographs from public areas, however, if you wish to take “Lineside” photographs you must at all times remain outside the Railway Boundary Fence. Please help make this a great event by downloading, printing and displaying the posters below; thank you. Branch Line Gala Week Poster. Public Timetable – Saturday 16 February. Public Timetable – Sunday 17 February. Public Timetable – Monday 18 to Thursday 21 February. Public Timetable – Saturday 23 February. Public Timetable – Sunday 24 February.